Southeastern Rodeo Association, LLC (SERA) believes the sport of rodeo should be promoted with integrity, good moral ethics and great sportsmanship. Southeastern Rodeo Association’s mission is all about providing affordable family entertainment. Not just any kind of entertainment, but high-quality entertainment. 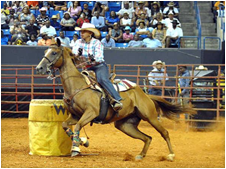 Southeastern Rodeo Association showcases professional cowboys in events such as Bronc Riding, Steer Wrestling, Calf Roping, Ladies Barrel Racing, Ladies Steer Undecorating, Team Roping, Bull Riding and Junior Barrel Racing for kids. Our mission is to provide top quality entertainment for the entire family. The Association is committed to keeping the cowboy way of life and upholding the important contributions the African American Cowboys played in helping tame the Old West. Additionally, the organization supports our community in the form scholarships for our children.